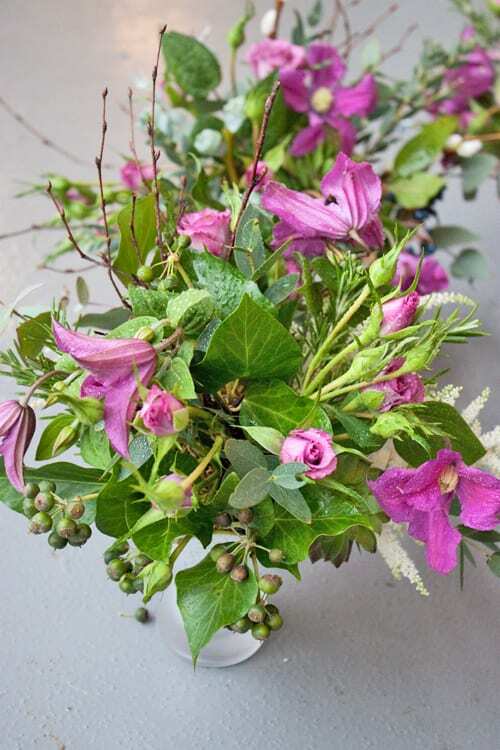 Last month, I was delighted to be invited to attend a Vintage Flowers course at The Sussex Flower School in East Hoathly, near Lewes. It was so lovely to finally meet Georgia Miles, the founder of the school. We’d been in contact via email since I featured an interview with her on Flowerona back in November 2011. And now she’s also an advertiser on my blog. The course started with us all introducing ourselves to the other attendees. Then we discussed what we thought vintage flowers actually were. Words which came to mind from the group were romantic, muted colours, informal, lace, hand-picked, old containers and even ‘granny’s cupboard’ was mentioned! 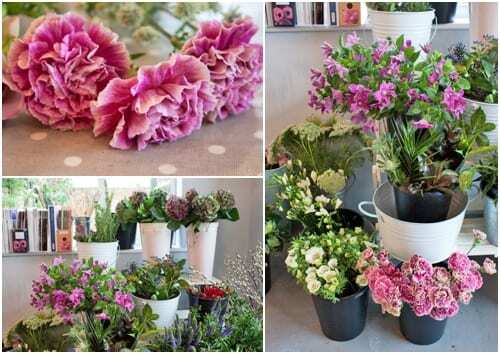 We had a great discussion about when, how and why the vintage flowers trend started. 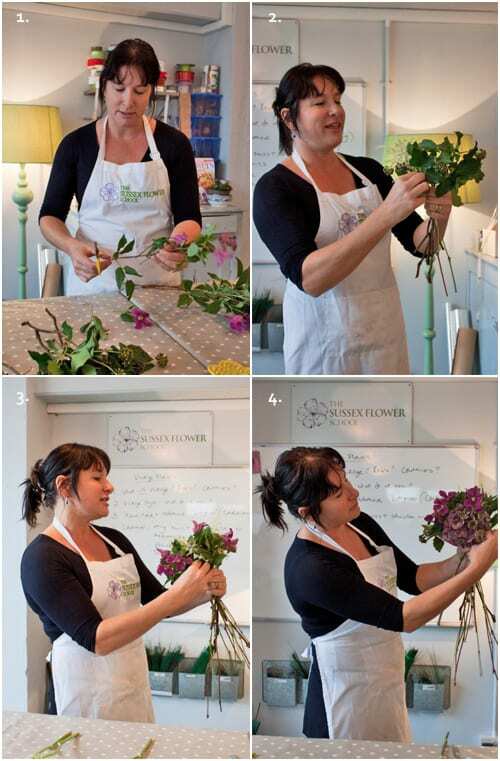 Then Georgia demonstrated how to make a hand-tied bouquet, using a lovely selection of ‘vintage’ flowers and foliage. 1. First she conditioned all the flowers and foliage. 2. 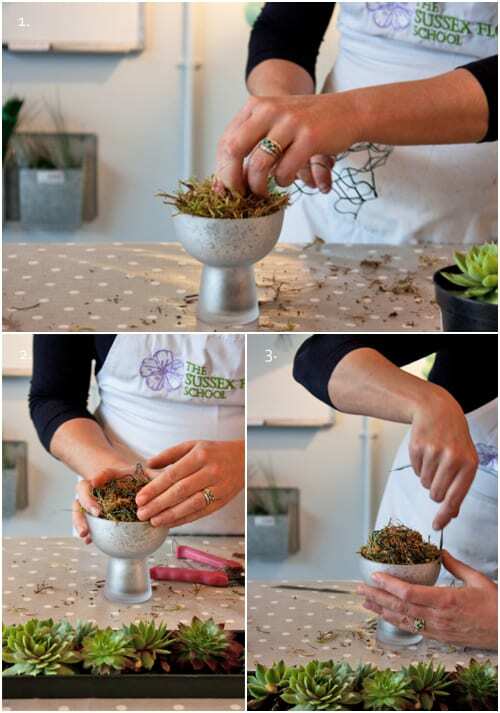 Then she started to make the bouquet with a few stems of foliage. 3. 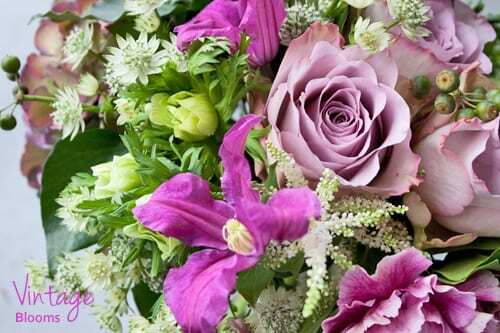 She added flowers, such as deep pink clematis. 4. Then added hydrangeas and other blooms in muted tones. 5. When her design was nearly finished, Georgia advised us to look at it in a mirror, to see if there were any gaps or whether the overall shape needed altering. 6. She then chose a complementary ribbon. 7. And wrapped the ribbon around the stems, before securing it. It was then our turn and here are our finished designs below. I love it on a course when we’re all given the same choice of flowers and foliage, but everyone’s designs are completely different! Lunch was next. And, oh my goodness (! ), it was absolutely delicious…cooked locally by a lady who uses Ottolenghi recipes. In the afternoon, we made a table arrangement, not using floral foam, but sphagnum moss and chicken wire. It was a way of creating a design which I’ve never done before and an interesting insight into how florists would have worked before floral foam was invented. 1. Georgia put moss into the container. 2. She placed scrunched up chicken wire on top. 3. Then she secured it with pot tape. Throughout the day, Georgia gave us so many hints and tips, including where to source containers and ribbon. Plus she showed us some beautiful books for inspiration. I so enjoyed my day at her flower school and would highly recommend a visit! 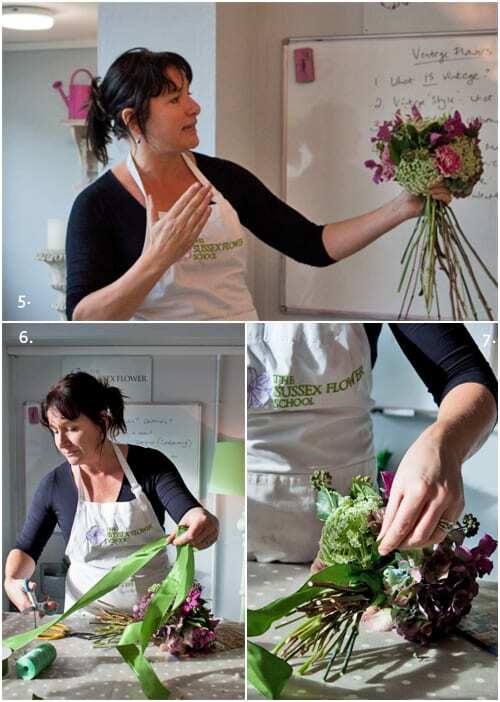 Do pop over to The Sussex Flower School website to see her full range of courses. Which books did she show you for vintage flower ideas? Hi Diane. A list from Georgia will be coming up shortly. 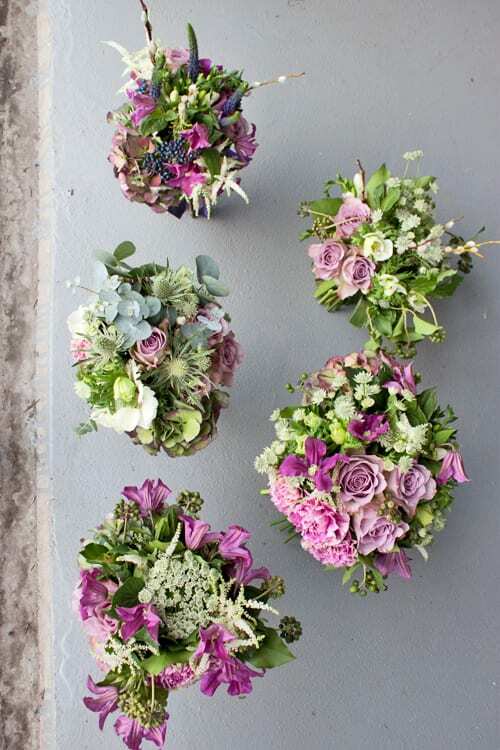 Loved the article on vintage flowers. Would love to know the books to read up on this. I so enjoy reading your articles Rona. Hi Gaynor. Georgia’s going to provide a list :-). Hi Georgia. That would be wonderful! Thank you so much. Best wishes, Rona x.
Hello! A list of books to inspire Vintage designs ….. Hope they help….We run lots of different courses at the school and Historical floristry is my specialist subject if you are interested….